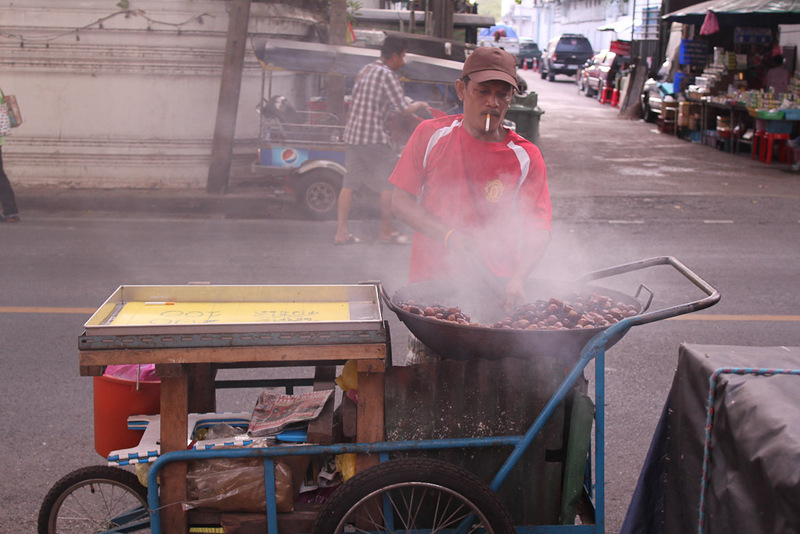 The street itself is mental, with bars pumping out tunes and men trying to get you to a ping pong show, as well as children begging and people eating scorpions off a stick. It’s a bit like ‘spot the Thai’ here too – there are so many tourists. We settled into our hotel for the night after a yummy green curry and pad Thai and a Singha beer on the street. Life is good. 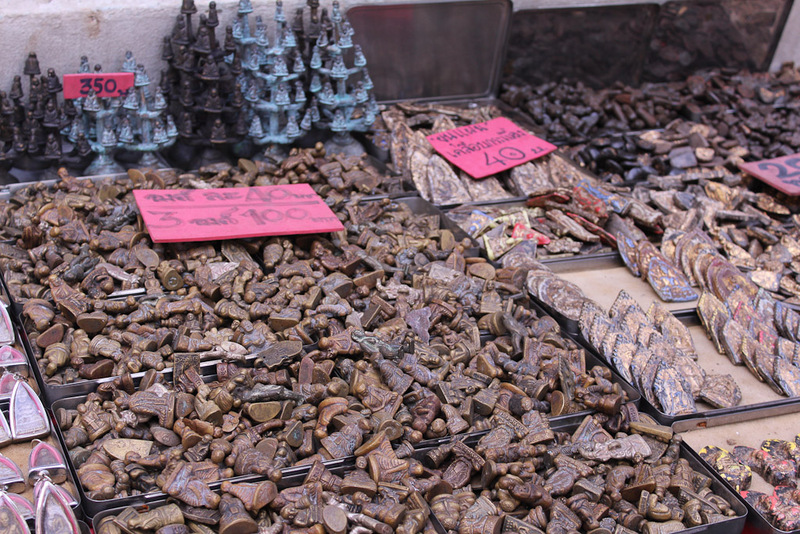 We wandered towards the Grand Palace in the morning and saw lots of stalls selling amulets, little images of Buddha. Men peer through magnifying glasses to try and seek hidden meaning in their little faces. We also saw stalls selling herbal medicines, millions of unidentifiable pills to ward off goodness knows what! 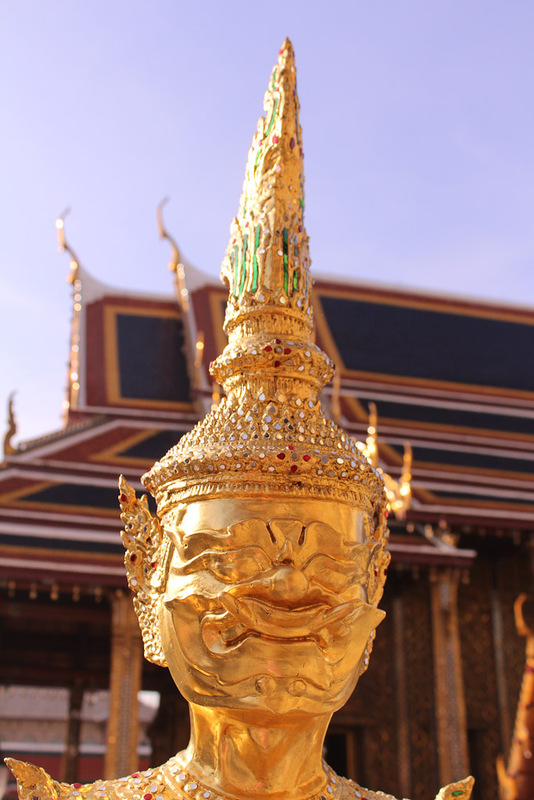 The Grand Palace was spectacular, although expensive at 500B ($20) each. The buildings were beautiful, with lots of gold and intricate mosaic that must have taken forever to complete. The Temple of the Emerald Buddha was a highlight, with so much detail that I actually missed the star attraction (the Buddha, only 66cm tall in a huge shrine) but Shaun saw it. We spent some time in the Siam area, moving between MBK, Siam Centre, Central World, and shops on the street, getting a few things we needed (and a few things we didn’t!). The malls are huge, very much like malls in the US or Europe. 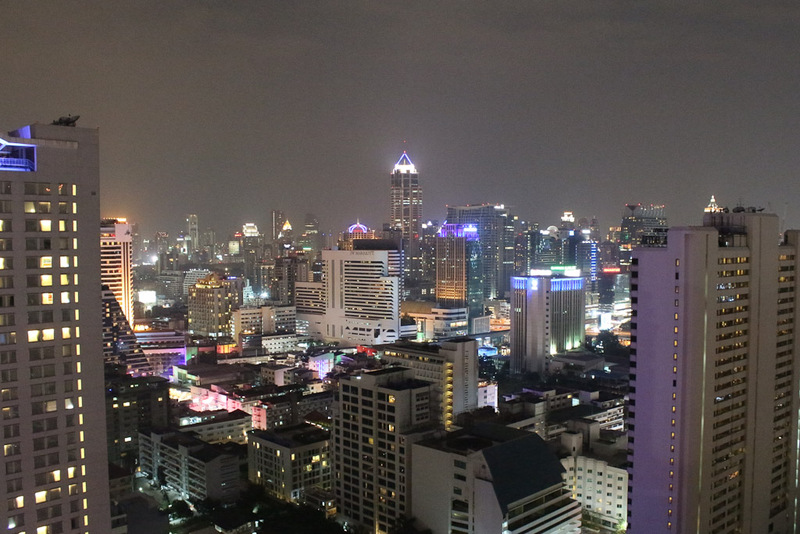 After shopping wore us out we headed to Above Eleven, a rooftop bar in the Fraser Suites hotel in Sukhumvit. We had to buy me a dress and Shaun some nice shoes to get into the bar (there was a dress code), so we were delighted that we got in! The view was absolutely spectacular. We could have stayed up there all night! The bar itself was really modern, apparently modelled on Central Park (fake trees and Astroturf, but not tacky at all). The food was Peruvian-Japanese – delicious. Even the bathrooms were amazing – Shaun reported that in the men’s there were two walls (the corner of the building) that were transparent glass that gave a magnificent view as you stood to pee! Well worth buying new clothes to go there. Our feet were incredibly sore after walking around all day so we took the skytrain and then a tuk tuk back to Khao San. 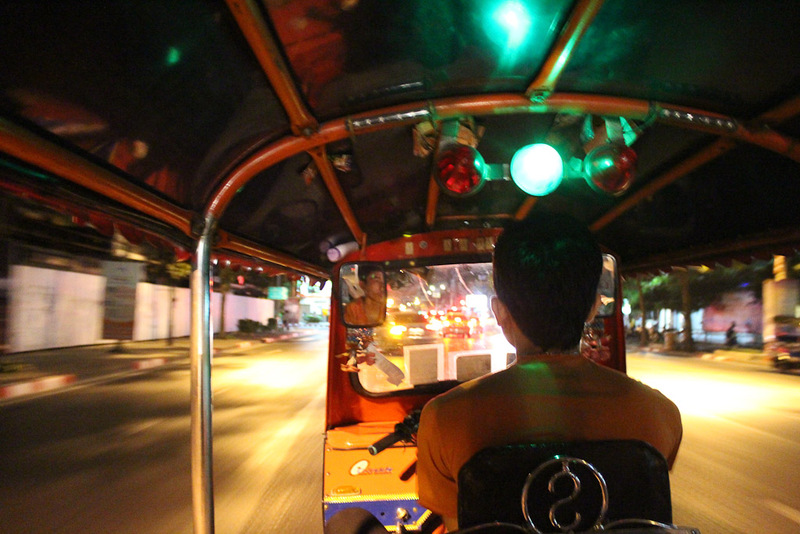 The tuk tuk was hilarious, such a thrill! 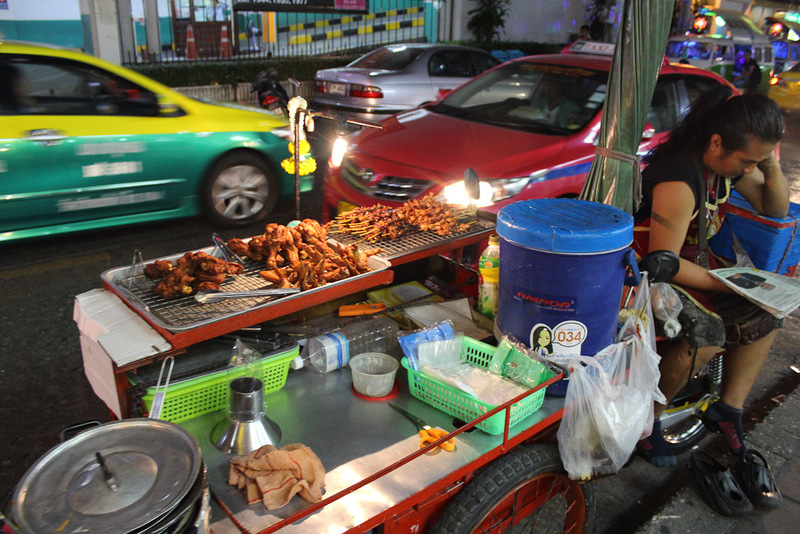 Every visitor to Bangkok has to take at least one ride. We had a foot massage on the street at Khao San (120B ($5) for half an hour! ), which was just what we needed after a long day out. So was the hotel ok??? Full of life there isnt it?? ?